There are a number of Open Source alternatives to the program MatLab, one of the most known alternatives is GNU Octave. 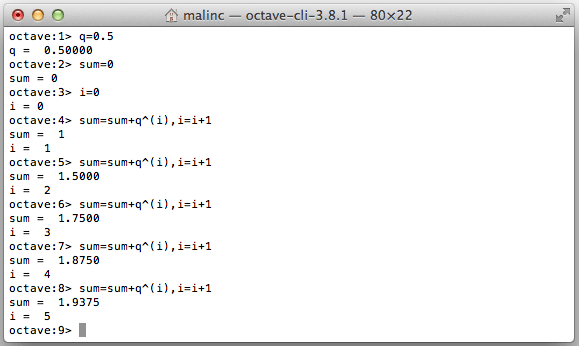 When using Octave you use a command line to enter commands. Octave can be downloaded and installed from GNU Octave. Open and run the XCode app to agree to the License Agreement. where /path/to/octave is the path. 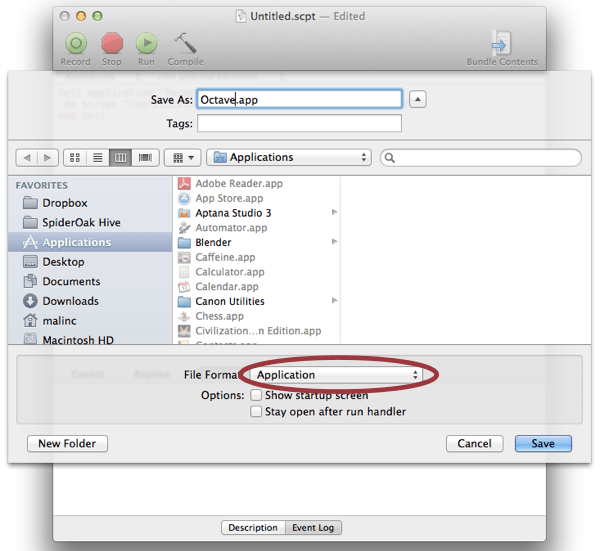 Save the script as Octave.app, select Application when saving. 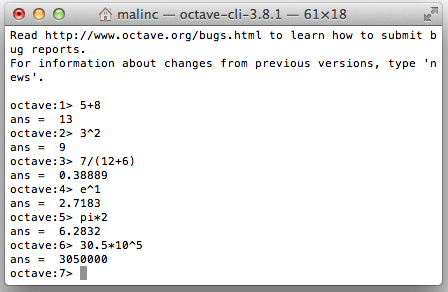 For more information see Octave for MacOS X. The easiest way to get started, is to use Octave as a calculator. pi , e , i Make a wild guess! floating point will give this answer. You can show more decimals by typing format long. Go back to showing few decimals by typing format short. You can see old commands by using up/down arrow keys. Exit Octave by writing exit or quit. When evaluating the value of an expression, the result is stored in a variable called ans (answer). You can also introduce variables of your own. By writing who you can see all variables. If you write a semi colon at the end of the line, the output is not shown. Some programs can handle letters like å, Æ, Ç, ü; others cannot. Use english names when programming! These rules apply to Octave and a number of other programs. The statement above would be false if it was a logical statement, it is however not a logical statement but an assignment. The right-hand-side of the statement is calculated first, the result is then assigned to the variable on the left-hand-side. You can write several commands on one line by using comma, or semi colon. By using up-arrow, you can repeat the previous command, and alter it. You can calculate a geometric series by using up-arrow several times. A geometric progression can be defined in different ways. Consider the infinite geometric progression \(3, 3\cdot 2, 3\cdot 2^2,...\). You can describe the geometric progression in two ways. Use Octave to find the limit as \(n\rightarrow\infty\) of following sequences. Type format long to show more decimals. Try different initial values \(c\), do you get different limits? Try to explain your answers. If you fail, do the exercises on Calculus - Fixpoints.